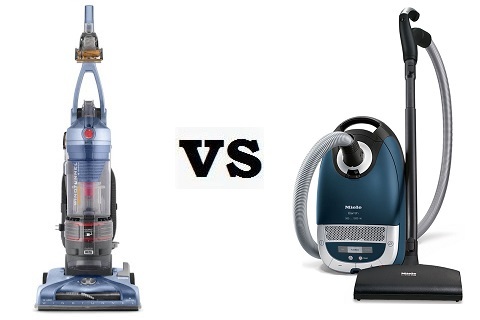 Should you choose an upright or canister vacuum cleaner ? While uprights vacuum cleaners have long been the most common type of vacuum cleaners in the US, more and more households are now choosing canister vacuum cleaners instead. This article will show you the pros and cons of both types, to help you make the right decision based on your needs. 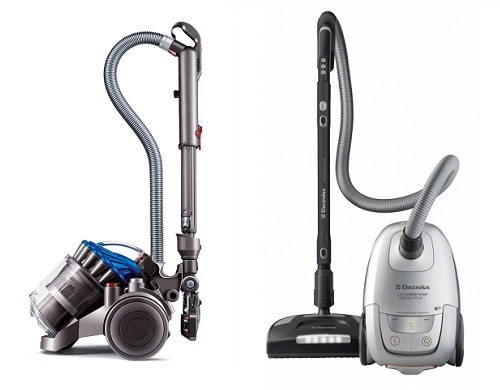 Upright or Canister Vacuum Cleaner : Which is the best for you ? Upright vacuum cleaners have a traditional and popular design : the motor and the suction head are put in the same unit, that the user has to push in front of him. 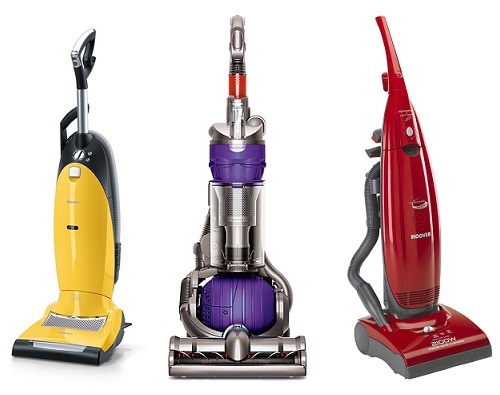 On average, upright vacuum cleaners tend to be cheaper than canister vacuum cleaners. Since they use motorized brushes, they are efficient when cleaning thick carpets and rugs. The transition between bare floors and carpets can simply be controlled with your foot. You will not have to bend your back, unless you use a hose attachment. The storage is easy, as there are no accessories to dismount and put away. They can also be operated without preparations. They usually have a wider cleaning path. Upright vacuum cleaners rarely have a good sound insulation, and are therefore noisier than canister vacuum cleaners. They can be heavy (up to 20 pounds), and difficult to drag back and forth in the entire house. They are also a lot harder to carry in stairs. They are less effective when cleaning corners or hard to reach places, even if some models are now equipped with a small hose for these purposes. With canister vacuum cleaners, the cleaning nozzle is placed at the end of a wand, and linked to the vacuum unit through a hose. This unit, or canister, contains the engine, filter and dust bags. It has wheels in order to be dragged by the user. Since there is no limitation to the size of the engine, canister vacuum cleaners are more powerful than upright vacuum cleaners. They have better suction and flow-rate, which means an easier and faster cleaning, especially for bare floors. Canister vacuum cleaners are lighter and easier to carry. They have a better maneuverability, and because of the hose they are more practical to clean stairs and other places which are hard to reach for an upright vacuum cleaner : under or behind furniture, or above the ground (upholstery, drapes, blinds…). They are easy to operate, because you only need to move the wand, and not the entire vacuum cleaner. You can maneuver more easily in stairs or tight spaces. They are more silent, since there is more room for a good canister sound insulation. They can be equipped with a variety of tools : crevice nozzle, upholstery brush, and even mechanized brush to increase their efficiency on carpets and rugs. These tools are usually conveniently placed either on the canister, or directly on the wand. That makes them very versatile. A good canister vacuum cleaner will clean carpets as well as uprights. Canister vacuum cleaners are not immediately operational : there is usually some assembly required before you can use them (put the accessories in place for example). So they are not as practical for a quick use. Because of the hose and wand, canister vacuum cleaners can be harder to store than upright vacuum cleaners. However, once disassembled they can fit in a small closet. Some people don’t like to drag the canister behind them. There can be impacts on the furniture or walls as you move (but this is less of an issue if there is a protective rubber casing on the sides of the canister). Besides, if the canister wheels are too small they can get stuck with power cords and thick carpets. The main issue is that you have to bend over more often when using a canister vacuum cleaner, which can be a problem if you have back pains. Some brands partly settle this problem by using hand controls on the wand, or with controls on the canister big enough to be used with your feet. However the arm motion you have to do when cleaning will still require you to bend down a little. Until a few years ago, upright vacuum cleaners were the preferred choice for carpets and rugs, and canister vacuum cleaners were the best choice for bare floors. Both types are now trying to bridge the gap, with upright vacuum cleaners with small hoses, and canister vacuum cleaners equipped with motorized brush accessories. The distinction between their preferred uses is less clear, but still exists. Buying an upright vacuum cleaner can be considered if your house has mostly surfaces of carpets or rugs, especially thick ones. The rotating brushes of the upright cleaners are better at extracting the dust from thick carpets than a classic floor tool. For an overall use however, the canister vacuum cleaner has a clear advantage over the upright vacuum cleaner. 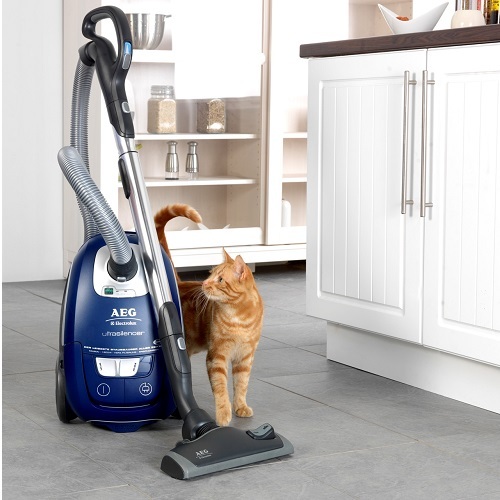 More powerful, silent, and easier to handle, a canister vacuum cleans faster and with less nuisances. If your house has mostly bare floors (tiles or wood), a combination of bare floors and of rugs, or if is a two-story house, then a canister vacuum cleaner would be a better investment. Just make sure that the canister you choose and its accessories are adapted to the kind of floors you have. In the end, it is also a matter of personal preference : some people are more comfortable pushing an upright in front of them, others prefer the maneuverability of the two different parts of a canister.